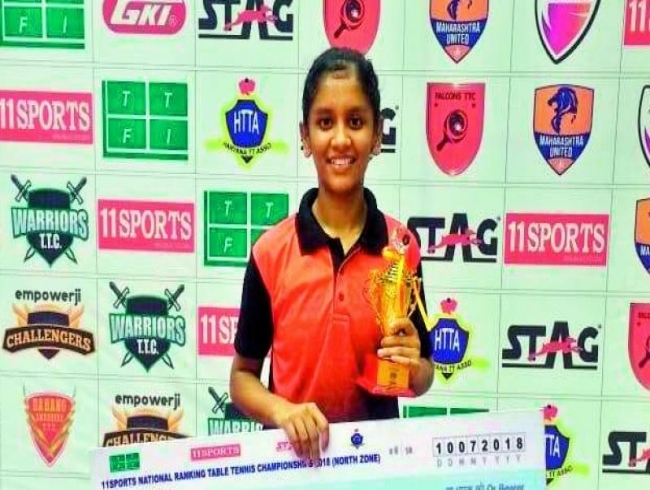 Hyderabad: Telangana’s Akula Sreeja continued her splendid performance to come out with flying colours while S. Fidel R. Snehit took the runners-up glory at the 11Even Sports National Ranking (North Zone) Table Tennis Championships held at the Tau Devi Lal Indoor Stadium in Panchkula, Haryana, on Tuesday. Sreeja became the first paddler from Telangana to win this championship. Sreeja won the Youth title by beating Saleendeepthi of Tamil Nadu by a 4-2 verdict. The scores read 13-15, 11-5, 12-10, 11-9, 9-11, 12-10. Meanwhile in the men’s final, Snehit failed to cross the final hurdle as he lost to Manav 2-4 in the finals to finish second best. The scores read 9-11, 8-11, 11-4, 11-7, 6-11, 4-11. Sreeja trains under coach Somnath Ghosh at the MLR Sports Academy in Dundigal and the Table Tennis center at the Meridian School in Banjara Hills. The chairman of MLR Sports Academy, Marri Laxman Reddy congratulated Sreeja and Ghosh on the achievement. Earlier, Snehit, who hones his skills under the former national champion S. Raman in Chennai, stunned the top seed in a hard-fought battle. Snehit defeated Achanta Sharat Kamal in pre-quarterfinals by 4-3 — 12-10, 9-11, 11-3, 11-9, 5-11, 12-14, 11-8. “I grew up adoring Sharat anna since my childhood. The win against him remains afresh in my memory forever,” Snehit said, who is also the first boy from Hyderabad to reach men’s finals after a long gap. n Youth girls final: Akula Sreeja (RBI) bt Selenadeepthi Selvakumar (TN) 13-15, 11-5, 12-10, 11-9, 9-11, 12-10. Semifinals: Akula Sreeja bt Archana Kamath (PSPB) 4-11, 13-11, 13-11, 11-4, 8-11, 11-6.
n Men’s final: S.F.R. Snehit (TS) lost to Manav Thakkar (PSPB) 9-11, 8-11, 11-4, 11-7, 6-11, 4-11. Semifinals: S.F.R. Snehit bt Arjun Ghosh (WB) 6-11, 9-11, 11-6, 11-13, 11-5, 11-6, 11-8.